Ok, this really has me stumped. In the "doctor's office" from 3dc (http://www.renderosity.com/mod/bcs/the-doctors-office-by-3-d-c/70499) there is one item which won't render. It's the clock face from the clock prop. The rest of the scene renders just fine, but the clock face renders as black (with the rest of the clock looking fine) whatever the lighting. It looks fine in the viewport, before rendering. 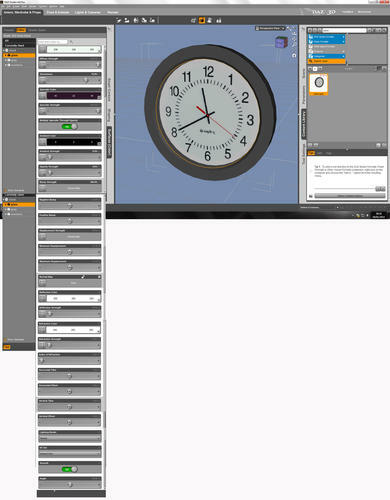 I have even tried changing the clock face texture JPG to another image of a clock face, but it makes no difference. What could possibly be causing this? I'm going to assume it's some opacity setting on the surface for the clock, not allowing it to display as if you're looking through a wall clock's plastic cover. 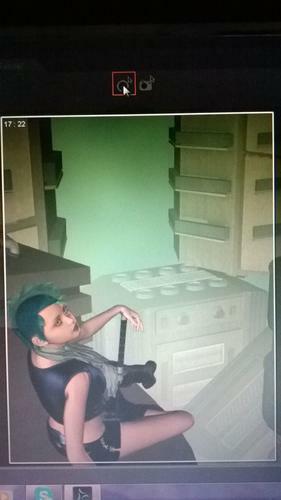 The set was built for Poser, so it will need tweaking texturally to look right in DS. No, it's not that. The clock glass has 0% opacity and it looks fine int he viewport before rendering. 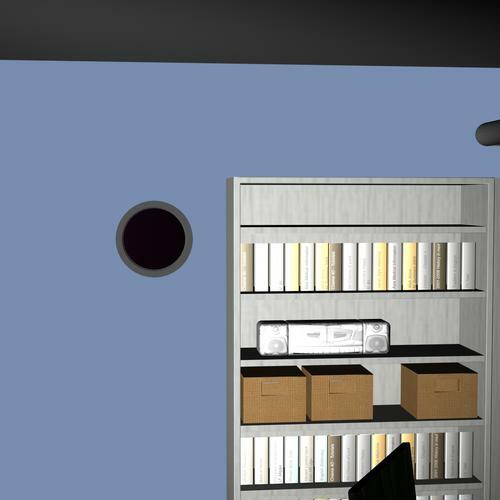 Anyway, the clock glass diffuse channel doesn't have the colour black, it is more like grey. So it's not that. If you could post the material settings, we could help you isolate the issue better. A object with 0% opacity should be invisible, but it might react differently if you added lights into the scene rather than using the default Daz headlamp. It's not rendering even with just the DAZ headlamp either. On closer inspection, the problem is not with the glass, it's actually the clock face itself. The error to me suggests that Daz is having problems with the file, since the tdl file it's looking for is a temporary file created when Daz exports data to the 3Delight render engine using TDLmake (when Daz is 'optimizing images' this is what it's doing). What was your lighting setup in the first image? It looked very similar to the Daz headlamp, which is why I suggested using an alternative lighting source. This won't solve your issue, but it will at least make erroneous issues easier to isolate. Aside from that, it might be prudent to also post details on the clock face itself or restart Daz and see if this solves the issue upon subsequent reloading. What is the filename of the file for the clock surface? (check in surface tab). Try opening the clock face image in an image editor and then resave it. Ah, I do have that set - the clock_1.jpg is a CMYK file, no wonder TDL Make doesn't like it. Converting it to RGB fixes the issue. I was reading this thread thinking, "I had this, I had this, I had .. how the heck did I fix this ...>" and ... it is just as you say, it took a while to track down! Yeah, tdlmake is rather picky when it comes to image files. CMYK is definitely out and so are some others...can't remember off the top of my head, but certain hdr files are one. You've probably already done this, but did you name the new clock face file "clock_1.jpg?" You know what? BRAINWAVE! When I created the new clock_1.JPG I did so by copying the new image over the old one, flattening the layers and re-saving. So it would have re-saved it still as a CMYK image. So my problem is solved after all! Thanks all of you clever people! Glad to have been able to hep, after getting help so often myself! What exactly happens when you click the render icon? Nothing, all that happens is that it says the file could not b saved in render and the window that shows the render remains blank. I tried resetting it to the default render settings and now the rendering screen just comes up blank and nothing happens. What are your render settings, and what is the exact message? You can take screen-shots using the Snipping Tool in Windows 7 and later, rather than using your camera (which may make reading text tricky). "The renderer encountered a memory error and the program has become unstable. Please close and restart DAZ Studio as soon as possible." And it won't render at all after that. I then set it to cartoon shaded and switched colours but the same thing keeps happening, please help me. I also reset the render settings to default. What are your system specifications - especially RAM? If you try to render, then go to help>Troubelshooting>View log what are the last entries, anything after the render command or the last file load that you recognise from before you rendered? RAM means how much memory is on your PC. Not to be confused with hard drive space either. This sounds like a hardware limitation, and machines with less RAM will have difficulty rendering scenes depending on their complexity. That could very well be the problem,I'll check my memory and of its too full I will delete unnecessary things. Hopefully that's the issue and it is resolved. Thank you for the explanation. To reiterate, hard drive space is NOT the same thing as memory. Memory is a hardware limitation and the only way to resolve it is to upgrade your PC. So while deleting unnecessary files might clear up hard drive space, it won't give you memory. The two are often confused to mean the same thing, but they are very different. The hard drive stores information even when the PC is turned off. The memory only stores information after it's been loaded, which is why having more RAM means you can load more things at once. This is crucial for 3D rendering, since it's loading in shaders, 3D models and textures into memory so that the system can process them. I consider 4Gb of RAM the absolute minimum for the most basic of scenes but ideally you want to aim for 8Gb or higher. The more memory, the better your PC can cope with rendering. You are thinking Hard drive space, where files are stored. there you will see some info about your PC. Look for "Installed memory (RAM): "
My father says the computer only has 2GB in space altogether but the remaining space that is free is 1.75GB. So he says he will see if he can get the number changed to 4 GB an hopefully that may help. If there are any other suggestions as to why it is only now giving trouble with rendering,I am open. Thank u all for your assistance. Yeah, 2GB of RAM is really low these days, especially for 3D rendering work. You're likely to find yourself restricted to more simple scenes and a smaller number of figures per scene. Even 4GB of RAM is quite a low sum, so you might not see the end of this problem yet. Still, you work with what you have. If you're low on RAM you may be able to composite different renders into one image by doing several different renders with transparent backgrounds. This way you get a decent level of complexity, but without straining your PC to death. If you live in the US, I've got 8GB of DDR3 RAM if it will fit your board. Is this a custom built computer or a pre-built with a model number? If it's a pre-built, what's the model number or if you know the motherboard make and model, I can look to see if the RAM will fit the board. Ah,that of be great but unfortunately I don't live in the US.